Important Notice: This plugin has been removed from the wordpress repository by the admins of that repository. According to them there were security risks with the plugin. I do not have time to make updates of the plugin in the future so for now it will not be updated. I recommend that you use another plugin for your tables. Websimon Tables is a wordpress plugin to create and design tables. 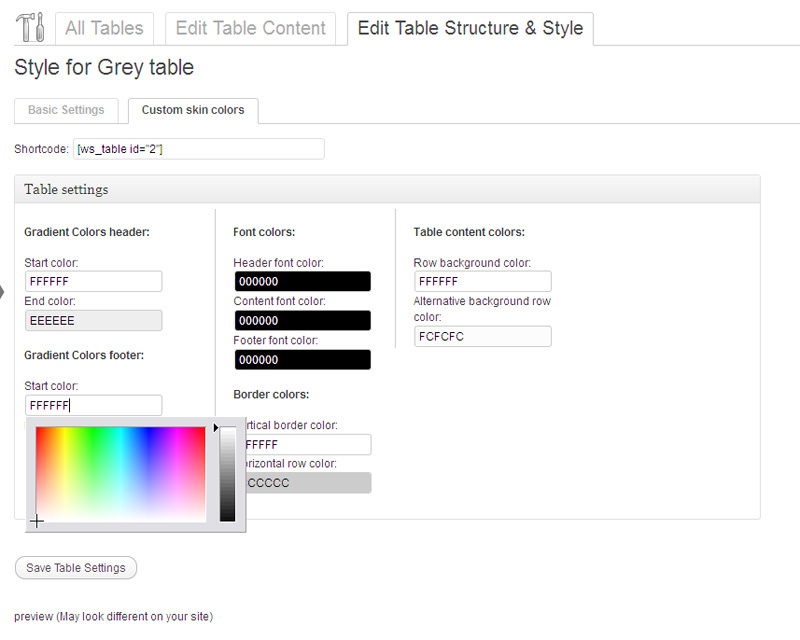 You can choose between 10 readymade skins or design your own custom html table design. 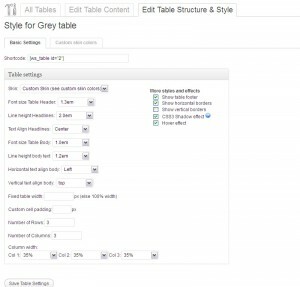 The reasons to why I created websimon tables are many but the most important one is that I wanted a fast way to create and manage good looking tables on my wordpress sites. There are som really good and advanced table plugins out there but I haven´t found any that has the design abilitys I wanted. 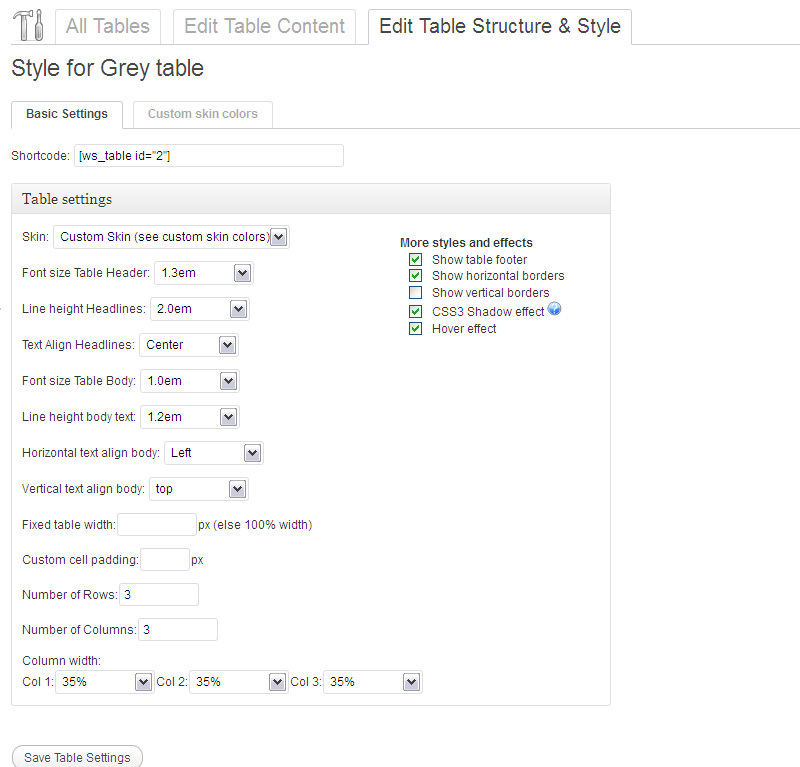 In this plugin you will find 10 readymade skins (see examples below) and the functionality to create your unique custom design for each of your tables. Well, that is what this table plugin does. Create and manage tables and css from your wordpress admin pages. Create as many tables as you want to. Shortcode to display tables in posts or pages. php Script to display tables directly from your code. Font size header and body. A custom design skin where you can design your table exactly as you want to. 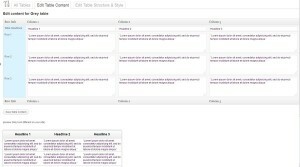 Upload the entire websimon tables folder to the /wp-content/plugins/ directory. You will find the admin page in "tools"
Q: Is it possible with shortcodes inside of the table? Q: How do you insert the table into a page? A: You insert the table into your page by using the shortcode available in the plugins adminpages. The shortcode can look like this: [ws_table id="1"]. Just paste this code directly in the text editor for posts or pages. Q: How do I put a textlink in my table? A: To add a link in the table content just use html code to display the link: <a href="link-destination" alt="my link">Link Text</a>. Q: If I want to use text or an image in the table, how do I edit to add a hyperlink to either? A: To add a picture in the table content just use html code to display the image: <img width="100px" src="image-source.jpg" />. To use the image as an link use <a href="link-destination"><img width="100px" src="image-source.jpg" /></a>. Q: How do I duplicate/copy a table? Q: How do I insert or move Columns/Rows in a table? Q: Is it possible to change the table name? Q: Is it possible to sort table content based on for example points or alphabetically? A: No not yet. I´m planning to make an update for that in coming releases! Q: Is there a rowspan/colspan functionality? Q: Is it possible to change the order of det rows? Same as 1.1.2 and 1.1.1 (which was a major update) but this update had to be done so that the update notification is sent out to all users. Bugfix - Fixes issue with some files and pictures not including correctly. New Feature - Its now possible to change the table name. New Feature - You can now disable the table header. 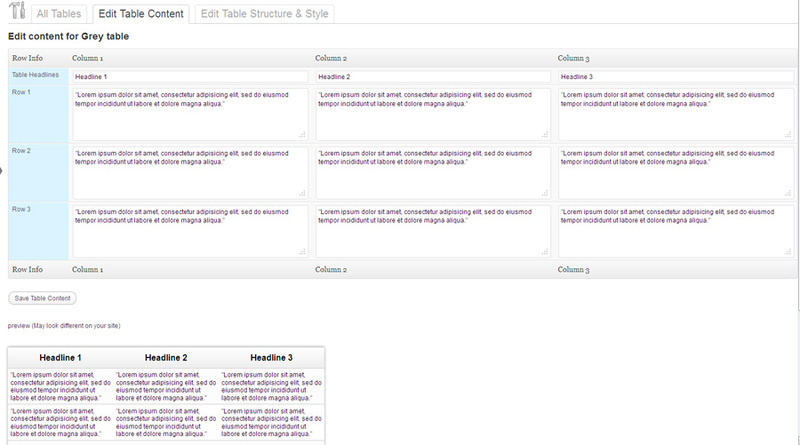 New Feature - Its now possible to empty a tables content without changing the structure and design. New Feature - You can move rows up and down. New Feature - Added some more textfields with the shortcodes for faster access. New Feature - There is now an unique css class for each row if you want to design each row separately. Bugfix - Fixed the issue that made the colorpicker not working. Small fixes with uninstall routines. Now the plugin table and the related options is deleted when plugin is deleted. Added som more save buttons when editing table content for tables with lots of information.